This is going to be an historic exploration of Mercury, Mariner 10 visited in the planet back 1971 with only a few brief passes which caused a stir back then. Now settled in orbit, Messenger will be collecting breath-taking data for the next three years! This is welcomed news for creation science as the second smallest planet in the solar system has been a major challenge for evolutionists but confirming data for creationism. Last time Mariner 10 flew by the planet it gathered some interesting data as well, such as Mercury’s magnetic field was discovered! Evolutionary scientists have come up with a story called the ‘dynamo’ theory, which was designed for the assumption of the solar-system being billions of years old and still have a magnet field because all other mechanisms would require that the planets be very young! The reason why Mercury had been such a surprise for evolutionists because of its magnetic field that contains north-south asymmetry which affects interaction of the planet’s surface with charged particles from the solar wind. Why would a small planet like Mercury having a magnetic field be a problem for planet evolution? Because for a planet to be billions of years old and still have a magnetic field, there must be fluid motions within a planet’s core. Therefore, the core itself must be molten. As one scientist put it, ‘Mercury is so small that the general opinion is that the planet [i.e. its core] should have frozen solid aeons ago’ which presents a problem and therefore, the core cannot be molten, and so evolutionary theories would have to conclude that Mercury cannot have a magnetic field. But yet it does and now its magnetic field is labeled as one of the mysteries of science as a result of the data not matching up with a fundamental theory in planet evolution and hopes Messenger will give them enough data to come up with a solution. Other observational data which does not match up with the assumptions of planetary evolution and considered another mystery of science, is the high density that Mercury has which is also second to Earth’s density in the solar system. This is a problem within the slow-and-gradual-development models. Like in other cases in the solar system that have particular data problems, the unobserved and historic catastrophic collision was invoked. What is the evidence for this collision? Nothing! Even with little gravity, this surprise consists of Mercury having an atmosphere but even more of a surprise, Mercury is loosing its thin atmosphere and this of course presents a problem with the assumption that the planet is billions of years old. So it somehow needs “the atmosphere has to be constantly regenerated” says one scientist. How this happens is unknown, again they lay hope on the Messenger mission will give them ideas. This historic exploration of Mercury will certainly be of great interest. Keep in mind discoveries can happen by accident as it doesn’t normally follow a particular method. Also, discoveries can happen by a hunch or a dream or even by mistake! But when it comes to explaining those discoveries that is an entirely different concept. Remember to keep discovery and explanation separate from one another when reading articles such as these. Scientists with their reporters will often mix them together, giving the illusion there is only one explanation between the two but there is not! The next three years is going to be exciting, can’t wait to see what is going on with Mercury! On March 29, 1974, one of the more surprising discovering during that year was Mariner 10 was not only able to find that Mercury has a lightweight crust, but the planet also contained a weak magnetic field which is about one-hundredth as strong as the magnetic field on earth. Because it didn’t generate the interest like Mars, exploration of the planet was put on hold till the idea of Messenger came about. 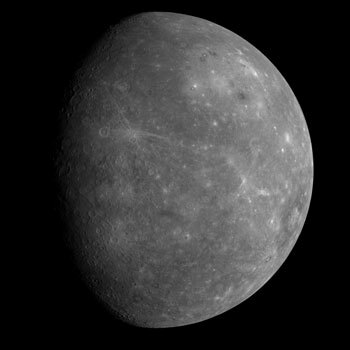 One of its primary objectives is to study Mercury’s magnetic field in order to account for its existence. The magnetometer is quite an amazing invention, well designed for its task on studying Mercury, and no doubt will complicate even more the dynamo theory. 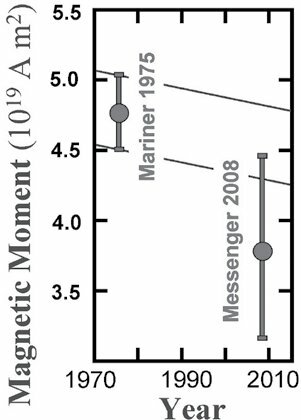 Back in 2008, Messenger was able to gather some information about Mercury’s magnetic field. This data was valuable, because in 1984, a creation scientist made the following scientific prediction based on the universe being young, not billions of years old. Messenger has successfully validated Humphreys prediction, now since the Spacecraft has just entered Mercury’s orbit a few days ago with it’s MAG measuring tool, scientists should get an accurate reading which is exciting and is expected to agree with the creationist model, but it’s also expected not to agree with the evolutionary model which will make the story even more complicated due to another falsification along with this falsification that includes creation scientists not making predictions in science outside the evolutionary framework. Messenger’s latest fly by of Mercury, was very interesting. The probe gathered important data about the planet’s surface and it’s magnetic field. What they found was an enormous amount of solidified lava on the surface of Mercury. This indicates the planet has gone through a lot of volcanic activity sometime during it’s history. “This hemisphere of Mercury is smoother than the other hemisphere, and we need to think hard about why that’s the case,” Zuber said.” National Geographic. This is quite plausible considering the planet had undergone major volcanic activity and with it being close to the sun placed purposely in an environment (like space) which is really cold. I wouldn’t be surprised if there is still some volcanic activity going on under ground. The biggest surprise, mainly to evolutionary scientists and intelligent design proponents (not to creation scientists) is Mercury’s magnetic field. It goes against what is known as the dynamo theory. In this explanation, the liquid core or the planet in general should have frozen out long ago because of the supposedly enormous age of the planet. Mercury’s magnetic field is actually revealing a much younger age, which is in line with the Creationist model. When scientists uses the term; “another difficulty for a theory” it means the data is not showing what a theory said it should be doing. Their particular work will include various explanations on how the data got different from the theory, but didn’t actually falsify the theory itself. The framework is limited and has been obviously falsified in this case, but their explanations are far from being limited. On a site note, concerning magnetic fields. It has been reported that evolutionary scientists had firmly rejected just 10 years ago, has been falsified. A magnetic portal denied at one time, has been discovered. The portal opens every 8 minutes, allowing tons of high energy particles to flow through. It connects the Earth and Sun. Seems the magnetic related theories in evolutionary thinking has been taking a beating lately. Space observation is very limited, for the most part it’s basically peering through a telescope. In some cases, unmanned spacecrafts like Cassini and Messenger have flown around planets like Saturn and Mercury to record data. Mars has been slightly different. With an historical belief in aliens there, it’s been the main focus of trying to find life. So the terrain is being explored. Evolutionary scientists have come across phenomena in space which they have no explanation for. So instead of sitting tight until the phenomena can be explained, these scientists proceed with story telling using acceptance mainly for proof that it’s somehow factual. “The energy known to exist in the Universe, however, is not sufficient to cause such acceleration. Thus, the theory most widely accepted within the scientific community is that there exists a ‘dark energy’, i.e. an energy that we cannot detect except by the gravitational force that it produces. In fact, it is believed that 73% of the energy of the Universe is dark. This is the type of research this is really not objective, but rather subjective and I call this fraud because for one thing, it’s reasoning for creating such an unproven hypothesis in the first place. Well we need something to explain it, so we can explain the rest, they claim. That’s utter nonsense, and certainly not true science. Those students who are interested in this area, one must keep in mind the limitations of the research, and try not get into the frenzy of creating unproven stories (to fill in the gaps). If you can’t find the satisfactory scientific explanation, even if the vast majority around you are storytelling, one has to keep searching for viable answers that explains phenomena. The universe is indeed a wondrous thing to behold as one looks at the night sky as one can see an array of stars and some planets. Even with the new discoveries, there is vast wealth of unknowns out there. Lots to discover and explore strange new worlds, perhaps humans will not get to understand it all, but we know one thing is for certain, it was created by God. To Him give the glory. There has been all kinds of explanations none of which holds up, this is what started the great curiosity for the exploration of Mercury. So NASA built and then sent Messenger to the planet to find answers. This side of Mercury was previously unseen until now. The bright crater just south of the center of the image is Kuiper, identified on images from the Mariner 10 mission in the 1970s. For most of the terrain east of Kuiper, toward the edge of the planet, the departing images are the first spacecraft views of that portion of Mercury’s surface. Messager was able to capture 30 percent of the planet previously unseen by the human eye. This is pretty exciting news, and no scientists haven’t explained away the planet’s electromagnetic effect. Although there was a strength difference from the previous encounter with Mariner 10. The electromagnetic field was weaker. Nobody has attempted to explain as of yet that I know of, the reason for the weaker field. But the field still exists which is contrary to the evolutionary hypothesis. Anyway, the spacecraft capture 1200 high resolution pictures in it’s second pass, I’m looking forward in seeing the results of these pictures which are currently been looked at by scientists. I will follow the story as events warranted it.